Hello friends, we have come a long way and since the blog is expanding with over 16 countries involved and quite a number of subscribers, I thought what better time to get to know a little more about me than now. So here are 22 random facts about me, you'd be surprised what you will find out. 20. One unique thing about me is my loyalty and commitment towards people, once I like you I can go all the way for you😍 But on the other side, I'm a no nonsense person. 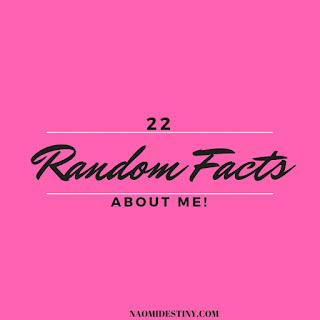 And there you have it, now I feel like you know so much about me (45%)✅ , so tell me what listed fact here do you like about me? And let's say if you could get to ask me one question, what would it be? Errrmmmnn...don't go too fast? I'd like to get to know you too! Tell me a random fact about yourself, would you? Please!!! Wow...beautiful facts you got there! I love everything, well except for your no. 13 & 21. I mean how do you do it??? I just can't! Hahaha...Sarah there you go again. I think it all drives back to how determined and passionate you are about what you want to do or achieve. We need to pray about that your book oh, the world must hear you. One fact about me is that I've been secretly stalking you (covers face), I just thought you should know since you asked! I really love how you do your things, you're amazing!